A simple combination of thyme and a touch of lemon makes this halibut a mouthwatering low-carb entree. 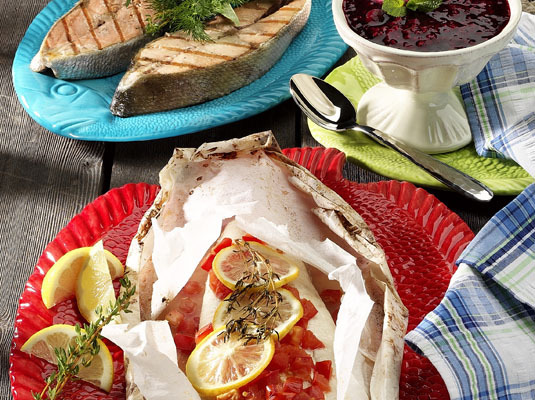 You wrap this lemon-thyme halibut in parchment paper (called en papillote), a process that may open up to you new horizons for cooking fish. Combine the olive oil and 8 sprigs of fresh thyme in a small saucepan. Over medium-low heat, simmer the oil and the thyme for about 20 minutes. Remove the oil from heat and allow to cool to room temperature. Check the fillets for bones and remove any you find. Cut 2 lemons in half. Cut the remaining 2 lemons in very thin slices. Cut parchment paper in 8 10-inch circles. Brush one side of each circle of parchment with some of the olive oil. Place the oiled circles oiled-side up on a large baking sheet that has sides. When the oil reaches room temperature, strain it to remove the thyme. Place each fillet in the middle of 4 of the oiled circles of parchment. Squeeze one of the fresh lemon halves over each fillet. Each half should give you about 1 tablespoon of fresh lemon juice. Drizzle 2 tablespoons of wine over each fillet. Generously brush each fillet with the thyme-flavored oil. Distribute 1/4 cup diced tomatoes on each fillet. Place a couple fresh slices of lemon and a fresh thyme sprig on top of each fillet. Carefully place a second oiled parchment circle on top of each fillet with the oil side against the fillet. Fold the edges of the parchment paper together, sealing well. Place the parchment packets on the baking sheet. Serve the fillets in their parchment paper. Foods cooked en papillote make stunning presentations. Be careful, however, when opening each pouch because steam will roll out along with the awesome aroma. Per serving: Calories 493 (From fat 289); Fat 32g (Saturated 4g); Cholesterol 70mg; Sodium 122mg; Carbohydrate 4g (Dietary fiber 1g); Protein 46g.